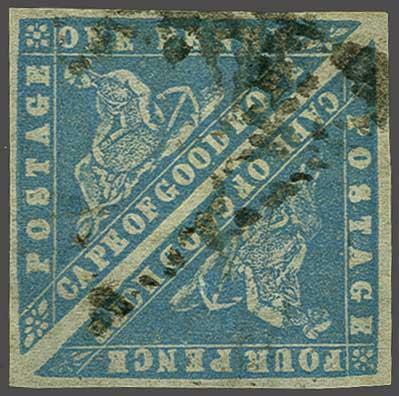 Provisional Issue 1861 (Feb 23): Woodblock 4 d. pale milky blue and 1 d. pale bright blue Error of Colour - the famous and exceptional used se-tenant pair, with large margins all round and of excellent colour, the CGH obliterator cancellation leaving both the FOUR and the ONE of value clear. 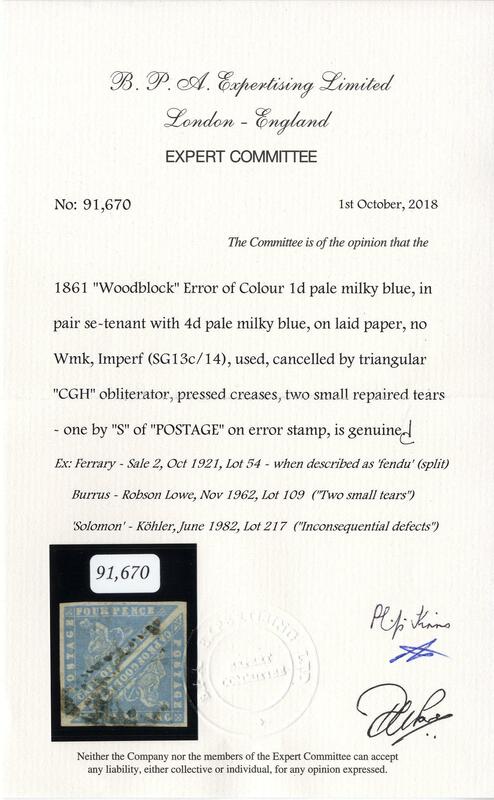 The error has two closed and restored tiny tears of absolutely no importance, this wonderful pair being by far the finest of the original three known examples (now four since the sale of one of Her Majesty Queen Elizabeth II's duplicates) of this error in pair se-tenant with normal, the Stevenson example had no margins and was also torn, the Dale-Lichtenstein pair with cut into on one side. This pair was first found in Graaf Reinett in 1867 and has not been on the market for 36 years. A gem for the connoisseur of classic philately. Cert. BPA (2018) Gi = £ 32'000+.rnrnProvenance: Collection Philipp von Ferrary, Sale 2, 13-15 October 1921, lot 54.rn Collection Maurice Burrus, RL, Nov 1962, lot 109.rn Collection 'Solomon', Köhler sale 236, June 1982, lot 217.